This Isidid from 1300 meters at Murray Seamount exhibits a whorled branching morphology, suggesting it is Acanella. But it branches at the internodes, suggesting it is Keratoisis. Click image for larger view. Bamboo corals are in the Family Isididae of the Order Alcyonacea within the Subclass Octocorallia (Bayer, 1981). Isidids are octo-corals, meaning they have eight pinnate tentacles on each polyp that can be either retractile (can be drawn in) or non-retractile. The bony calcareous structures (internodes) are interspersed with proteinaceous gorgonin (nodes) not composed of fused sclerites. 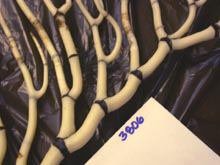 This structure gives the skeletal remains of the organism an eerie fingerlike appearance. Drs. Frederick Bayer and Stephen Cairns of the Smithsonian Institute in Washington D.C., estimate 38 genera and 138 recent species within the family Isididae worldwide. Two ways to distinguish between species are by morphology (the body shape) or by the sclerites, which are small calcareous structures in the tissue of the polyps. To identify a sclerite, a scientist needs three thingsa preserved tissue sample, a scanning electron microscope, and a trained eye. 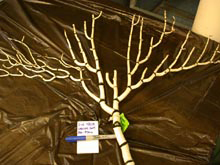 This Isidid from Warwick Seamount exhibits branching at the nodes and the internodes, although nodal branching dominates the colony. Click image for larger view. Very little is known about bamboo corals. Scientists on board the R/V Atlantis on the Gulf of Alaska Seamount Exploration Expedition are particularly interested in these bamboo corals because they are quite beautiful and can live for centuries. An archive of past oceanic conditions resides within both the calcium carbonate that makes up the internode, and the nodal organic gorgonin. We can also determine the age of the specimen by carefully teasing out other information. Though we know little about bamboo corals, we do know that they form habitat for associated species, including crabs and larval fish. On the relatively barren seamount plains, one meter of structural relief can improve the survival rates of these associated species by providing refuge, settlement substrate, and/or a feeding perch. Similar to trees in the forest that perform a similar function for birds, tropical corals perform this function for reef fish and some invertebrates. When the Alvin reaches the deck of the R/V Atlantis, it is common to hear scientists call specimens by their Latin names. Bubblegum corals are actually Paragorgia arborea; gold corals can refer to species in the genera Gerardia or family Primnoidae. However, when bamboo corals surface with the Alvin, and they often do, we are resigned to calling them "bamboo corals" because the family "needs revision." In other words, the actual species can be a mystery. This Isidid from 700 meters at Warwick Seamount exhibits the planar, candelabra structure of Isidella. Note the branching at the internodes. Click image for larger view. Traditionally, Isidids in the subfamily Keratoisidinae are identified by their branching morphology. The polyps are not retractile, and the sclerites of the polyps are large spindles, needles or rods, arranged longitudinally, and smaller rods or scales arranged irregularly (Bayer, 1981). Sclerite identification can be time-consuming and expensive. Therefore, Frederick Bayer devised a morphological key to identify the four species that exhibit these qualities. Each has a different shape. Lepidisis colonies are unbranched, like sea whips, but they have an axis of proteinaceous nodes and calcareous internodes. Lepidisis is the only documented unbranched genera of Keratoisidinae. There are three branched genera. 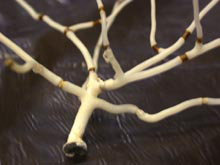 In Keratoisis, the branches arise from the nodes. In Isidella, the branches arise from the internodes, and the colonies are flat and spreading like candelabra. In Acanella, the branches also arise from the internodes, but the colonies are bushy, and branch in whorls. During this expedition, we acquired specimens of each of these morphologies, except for Lepidisis, although we observed small specimens of what appeared to be Lepidisis on several of the dives. We also acquired some colonies that exhibit branching at the node and the internode. We also found species that branched in whorls. Thus, the traditional methods of species identification are confounded, making our discoveries that much more exciting! Dr. Amy Baco-Taylor at Woods Hole Oceanographic Institution has been collecting and preserving samples to send to the Smithsonian Institution, and I have been mapping the known distribution of this family and others. This cruise alone extends the known distribution of four families of deep-sea corals in the Northeast Pacific (Isididae, Primnoidae, Paragorgiidae, and Corallidae) from the continental shelf to four seamounts in the Gulf of Alaska. Bayer, F. 1981. Key to the Genera of Octocorallia Exclusive of the Pennatulacea (Coelenterata: Anthozoa), with diagnoses of new taxa. Proc. Biol. Soc. Wash. 943(3) pp. 902-947.